It’s that we’ve all had a little too much sun from time to time (yes, even Dr. Russak, though that was a long, long time ago!). No matter how hard you might try now, years of sun damage may have accumulated during your carefree teenage years. Or it might be that you forgot to reapply SPF after a few swims during that trip to Palm Springs. Why is late September and early October the best time for peel and laser treatments? By late September/early October the days are shorter, the sun is weaker and we’re likely spending more time indoors and less time having fun in the sun (sad, but true). 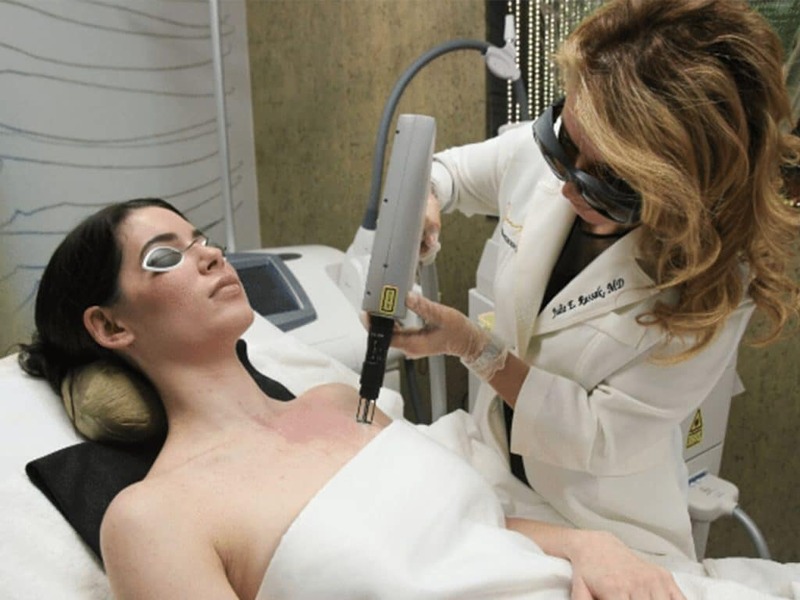 Most peels and laser treatments (with the exception of Clear+Brilliant) are not safe during summer months due to long, sunny days and more (mostly unavoidable) sun exposure. Peels and laser treatments remove layers of skin at varying depths and cause temporary ‘injury’ to the skin to promote new collagen synthesis and cell turnover. This is great for the skin in the long run, but it’s not good when that same raw, new and vulnerable skin is exposed to damaging UV rays. How can I erase sun-induced pigmentation and achieve that #nofilter look? One of the most common ‘problem areas’ we see at our office is pigmentation (brown spots or dark, blotchy patches) caused by the sun. They can show up on the face but are also incredibly common across the neck, chest and hands. 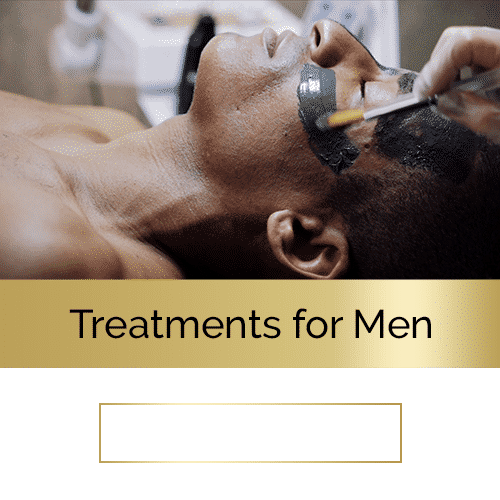 The best treatment for targeting these stubborn spots and getting back that bright, luminous complexion is to try chemical peels and intense pulsed light (IPL) treatments. A series of Alpha Hydroxy Acid (AHA) peels can drastically improve the tone, texture and appearance of sun-damaged skin while IPL treatments use light energy to target and destroy pigment, redness, broken capillaries and much more. We generally recommend combining both treatments for the best results. In a few weeks, you’ll enjoy brighter, more even-toned skin that will look years younger. Advanced levels of sun damage can cause premature signs of aging like fine lines and wrinkles. 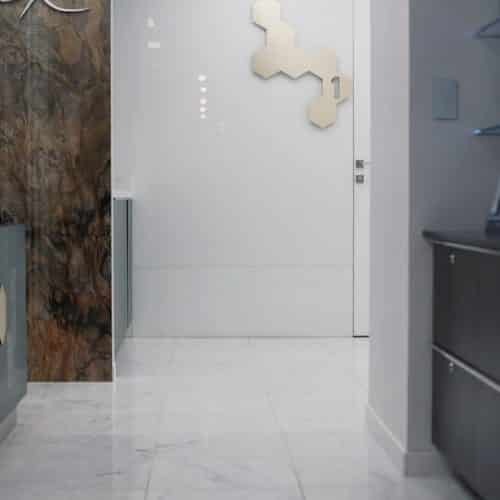 For this, we bring in our advanced laser technique: fractional laser resurfacing. With the Palomar Icon technology we’re able to create short, pulsating beams of light that create controlled damage to ‘fractions’ of the skin. This promotes new, healthy skin production deep within the dermis which brings more extensive results including smoother, healthier-looking skin. For dull, lackluster skin caused by summer damage, what’s the solution? We’ve all struggled with skin that looks tired, dull and ‘grey’. This is particularly common after the summer fades and our sun-damage starts to show. For this skin plight, we always recommend a trio of treatments: IPL, microneedling and platelet-rich plasma (PRP) treatment, because we’re here to deliver you the very best results for a ‘wow’ complexion. How do they work? IPL banishes stubborn brown and red spots and pigment irregularities. 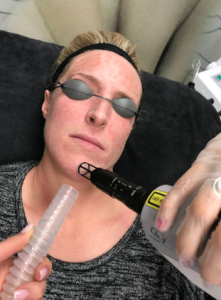 Microneedling (or collagen induction therapy) promotes new collagen synthesis with controlled injury, while PRP harnesses the power of your body’s own growth factors to promote healing, new skin generation, and that ‘what did you do? !’ glow. Ready for book your peel or laser treatment?